Nothing spells ease like an instant pot! And nothing tastes better than this instant pot minestrone soup recipe, especially on a cold winter day it’s warming and comforting. Nothing and I mean n-ooo–thhh–iiiiing spells ease like an Instant Pot! Yep, I am in love. I mean, if you can be in love with a kitchen appliance, this would be it! 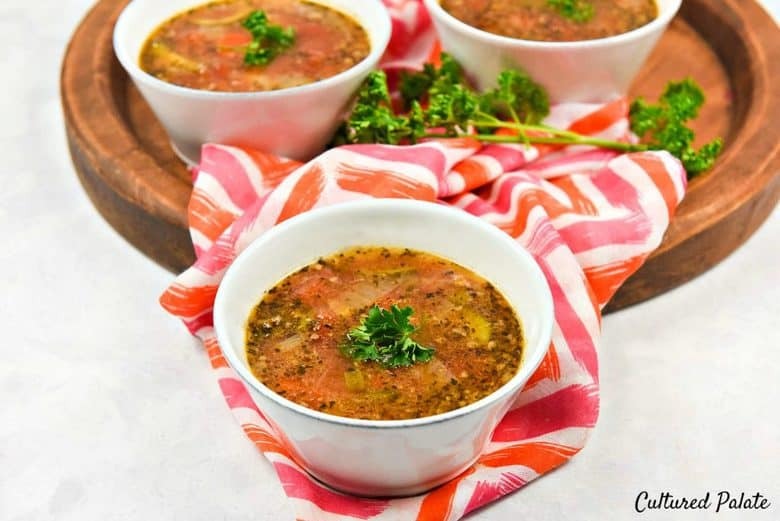 You will see why once you try my Instant Pot Minestrone Soup! Seriously, I am not kidding you – this thing is fast. I have been a devout crock pot cooker for years and I love the way you just put everything in it, turn it on and forget about it. But, the Instant Pot is a bird of a different color. Watch the video and see for yourself and then I will tell you more about it. I love knowing what other people use and why they like it. Here are the things you see me using in the video. The links will lead to Amazon and a couple to eBay . Instant Pot – I am totally in love with my Instant Pot and will tell you more about it below. Polish Pottery – I bought most of my Polish Pottery when we lived in Switzerland for John’s job – we were there 4 years and I found quite a bit, to say the least! When I am looking for a new piece or need to replace a broken one, I shop eBay. Le Creuset Spoon Spatula – This is definitely my go-to spatula. Shaped like a spoon it is great for scooping and the silicone allows it to get the very last drop when you are scraping a dish. Half Gallon Jars – I love these jars because they are wide mouth, easy to clean and just great for storage. I use these to store my bone broth, soups, sauerkraut…you name it. Bread Board – While this particular one is no longer available, you can check eBay – it is made by Europe2You. If you are not familiar with an Instant Pot, let me tell you about it. Think pressure cooker, crock pot, saute-r (I don’t think that is a word but you get my drift) – you name it and it will most likely do it. You can even cook rice and yogurt with the preset settings not to mention the thousands of things you can make with the other settings. Did you catch the pressure cooker part? That is the part that cuts your time down amazingly. I have always been afraid of pressure cookers but the Instant Pot has new safety features that has alleviated even my fears about them. Just one time making Instant Pot Minestrone Soup and you are going to be hooked foreeeevaa. The following recipe was adapted from a slow cooker/crock pot recipe that my sister had. To save time, chop all ingredients while onions are sauteing and ground beef is browning. This can be refrigerated and even frozen so make a pot full! Other ingredients can also be added like yellow squash and even small pasta noodles. Don’t have an Instant Pot? 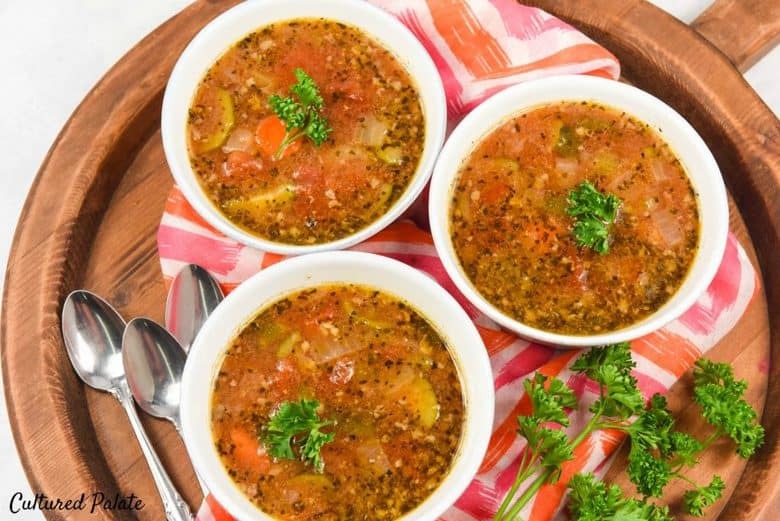 You can still make this Instant Pot Minestrone Soup recipe in your crock pot. Just brown the ground beef and put it into your crock pot. Then, saute your onions, carrots and celery until they are just tender. Finally, add the sauteed veggies along with all the other ingredients to the crock pot and cook for about 6 hours on high or 8 hours on low. Add the zucchini the last 30 minutes. 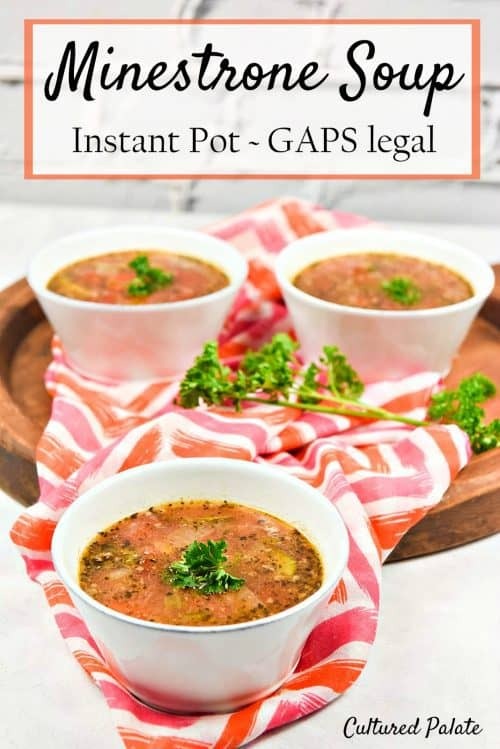 One of my favorite things about this Instant Pot Minestrone Soup recipe, besides the great taste, is that it is GAPS legal. But, don’t think you can’t have this soup if you are not doing the GAPS diet. It is healthy for everyone and has that extra oomph of flavor that the homemade bone broth gives. 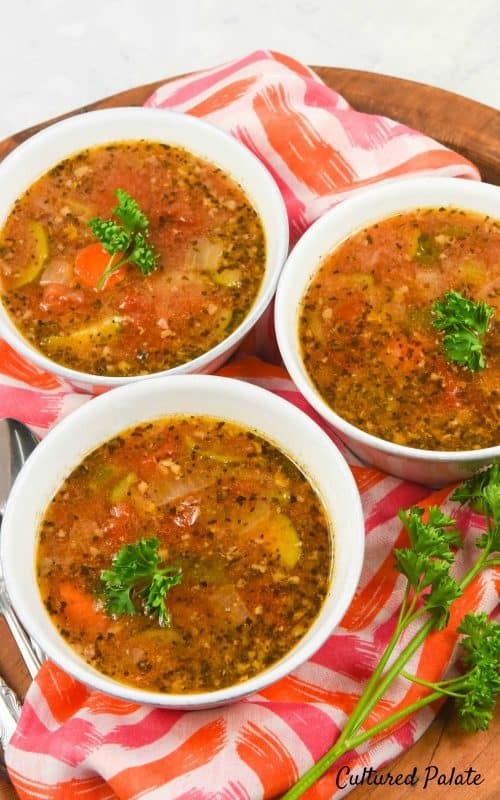 If you’ve tried this instant pot minestrone soup recipe or any other recipe on Cultured Palate please take a minute to rate the recipe and leave a comment letting me know how you liked it. I love hearing from you! You can also FOLLOW ME on PINTEREST, FACEBOOK, INSTAGRAM, YouTube and TWITTER. Nothing says yum like a hearty bowl of Minestrone Soup. Combine the great taste with the speed of using an Instant Pot and it is a win-win. With Instant Pot on "Saute", saute onions in a small amount of oil until transluscent. 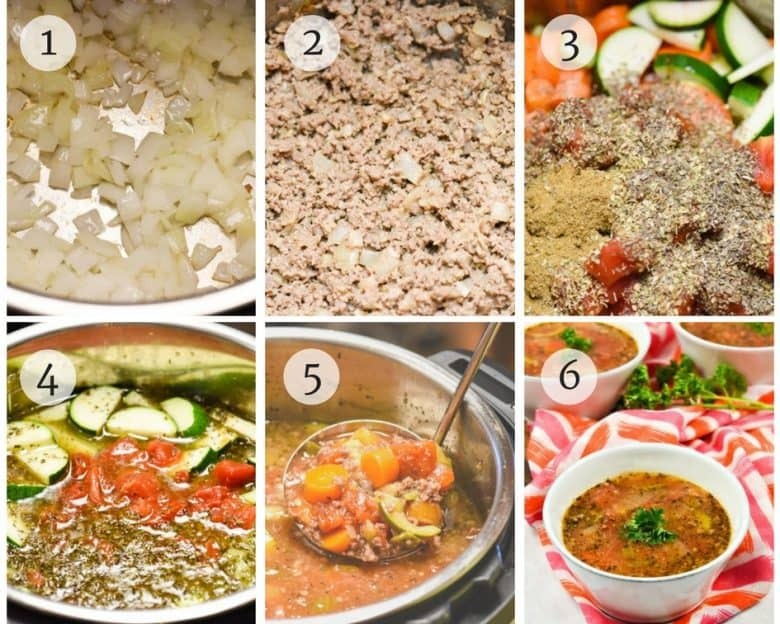 Add other ingredients to Instant Pot and turn on "Manual" for 8 min. Use the quick release to let the steam out. Be patient because this can take a few minutes but its important. Brown ground beef and put in crock pot. Saute the onions, carrots and celery until they are just tender. Add sauteed veggies along with all the other ingredients except the zucchini to slow cooker. Add the squash during the last 30 mins. if cooking on high or, the last 1 hour if cooking on low. This recipe is awesome! I hope to see more instant pot recipes soon! Tina, you will – this mamma loves her Instant Pot! I think you’ve just convinced me to get an instant pot, they sound great and this soup sounds delicious!